Tyler Sharpe contests a shot versus Milwaukee on Jan. 26. Norse outscore UIC in fast break points 15-6. The Norse lost 69-67 against UIC Sunday afternoon, now making their record 18-6 on the season and 8-3 in the Horizon League. UIC Flames improve 12-12 overall and now sit 6-5 in conference play. Junior guard Tyler Sharpe led the charge with 20 points and 4 assists. Followed by senior forward Drew McDonald with 18 points and 9 nine rebounds and redshirt sophomore Jalen Tate with 12 points, 4 rebounds, and 3 assists. The Norse had a slow start, with UIC going on a 7-0 run to make the score 13-4 seven minutes into the game. The Norse were able to go on an 8-0 run to get within three points of the Flames but never got any closer during the half. The Norse shot 32 percent from the field for the half. The Flames led the game 33-25 at halftime. The second half started off better for the Norse with an 8-0 run to tie the game 33-33. The Norse took a one point lead five minutes into the game, but the battle to stay on top was rough. With just under a minute left McDonald hit a jumper to put the team up 67-66. UIC makes a three point shot with two seconds left to put them up 69-67. 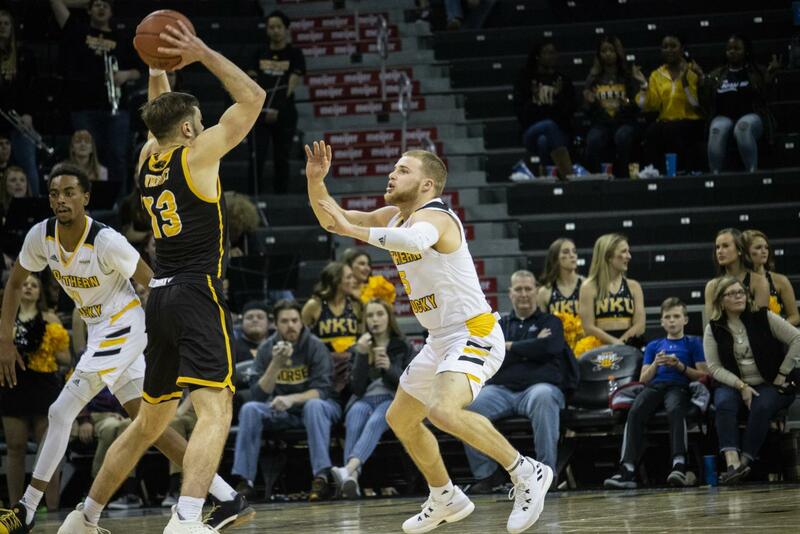 During the second half the Norse offensive effort improved, they shot for 48 percent from the field, and 41 percent for the game. The Norse were 6-20 from three point range for the day. The Norse lost the rebounding battle 37-32, but won the turnover battle, only giving the ball away 14 times while the Flames had 18 turnovers of their own. The Norse outscored UIC in fast break points 15-6. Next up for the Black & Gold the team is back at BB&T Arena against Detroit Mercy to kick off the weekend of Homecoming festivities on Thursday, Feb 7. Tip off is set for 7 p.m. The game will be broadcasted on ESPN+ and FOXSports1360.